Despite all the fanfare surrounding the signing of this document—which is being portrayed as a “historic pledge of fraternity” and a “historical breakthrough”—it is hard to take it serious, to see it as anything more than a superficial show. Why this cynicism? Because one of these men, Dr. Ahmed al-Tayeb, has repeatedly contradicted—if only when speaking in Arabic and appearing on Arabic media—all the lofty sentiments highlighted in the document that he signed. Freedom is a right of every person: each individual enjoys the freedom of belief, thought, expression and action… [T]he fact that people are forced to adhere to a certain religion or culture must be rejected, as too the imposition of a cultural way of life that others do not accept. Yet many liberals and Muslim reformers in Egypt insist that the “unprecedented persecution” Egypt’s Christian minority, the Copts, experience, is directly traceable to the institution al-Tayeb heads: Al Azhar. Similarly, Egyptian political commentator Dr. Khalid Montaser once marveled that, “at this sensitive time—when murderous terrorists rest on [Islamic] texts and understandings of takfir [accusing Muslims of apostasy], murder, slaughter, and beheading—Al Azhar magazine is offering free of charge a book whose latter half and every page — indeed every few lines—ends with “whoever disbelieves [non-Muslims] strike off his head”? It [Al Azhar] can’t [condemn the Islamic State as un-Islamic]. The Islamic State is a byproduct of Al Azhar’s programs. So can Al Azhar denounce itself as un-Islamic? Al Azhar says there must be a caliphate and that it is an obligation for the Muslim world [to establish it]. Al Azhar teaches the law of apostasy and killing the apostate. Al Azhar is hostile towards religious minorities, and teaches things like not building churches, etc. Al Azhar upholds the institution of jizya [extortion, “protection money” demanded of non-Muslims subjects]. Al Azhar teaches stoning people. So can Al Azhar denounce itself as un-Islamic? Similarly, in 2015, when the world was shocked because the Islamic State videotaped a Jordanian pilot being burned alive, Egyptian journalist Yusuf al-Husayni remarked that “The Islamic State is only doing what Al Azhar teaches.” He too went on to quote and cite from textbooks used in Al Azhar that permit burning people alive. I have noticed that they are always telling us that terrorism is Islamic. All those mouthpieces that croak—out of ignorance or because they were told to—that the Al-Azhar curricula are the cause of terrorism never talk about Israel, about Israel’s prisons, about the genocides perpetrated by the Zionist entity state…. If not for the abuse of the region by means of the Zionist entity, there would never have been any problem. In March 2016 before the German parliament, Sheikh al-Tayeb made unequivocally clear that religious freedom is guaranteed by the Koran, while in Cairo he makes the exact opposite claims…. Combating terrorism and radical religious ideologies will not be accomplished by directing at the West and its international institutions religious dialogues that are open, support international peace and respect freedoms and rights, while internally promoting ideas that contribute to the dissemination of violent extremism through the media and educational curricula of Al Azhar and the mosques. It is for all these reasons that al-Tayeb’s signature on “A Document on Human Fraternity for World Peace and Living Together” is not worth the paper it is written on. 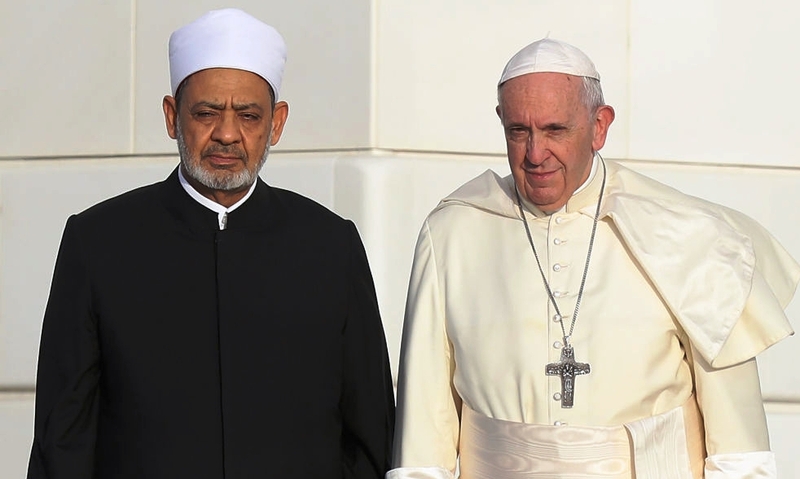 And if Sheikh al-Tayeb is a wolf dressed in sheep’s clothing, Pope Francis is apparently a starry-eyed shepherd leading—or at least leaving—his flock to the slaughter.